One of the famous dams of South India, Krishna Raja Sagara Dam is often called as KRS Dam. Named after Krishnaraja Wodeyar IV of Mysore, this dam is built over the River Cauvery/Kaveri; near to the conjunction of three rivers namely, Cauvery, Hemavathi & Lakshmana Thirtha. A major source of drinking water for Mysore and Bangalore city, KRS dam is also one of the main sources of irrigation water for Mandya and Mysore. Along with this, it major purpose is to ensure power supply to the Shivanasamudra hydroelectric power station. With a length of 3 km, this dam also boasts of being the first irrigation dam of India. What set this dam apart from other dams are the exceptionally beautiful site and the areas around it. 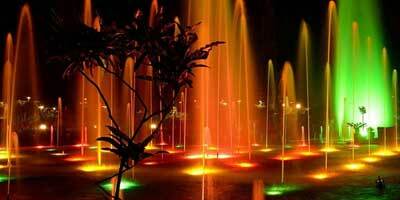 The dam site is bestowed with colorful, stunning and even illuminated gardens, musical fountains and water bodies. The beauty of the site is so riveting that it is often used for shooting of movies. Located between Srirangapatna town and Mysore city, KRS Dam is not only an important part of Mysore trip but also presents a suitable weekend getaway from Bangalore. Proximity to another popular sightseeing place in Mysore, Brindavan Gardens, which have been created in its complex, makes a visit to this dam a must for every traveller. Built during the rule of Wodeyar's in 1932, KRS Dam still presents glimpses into the spellbinding architecture of that time. This dam has an impressive height of 130 feet and 152 sluice gates. It is the creation of one of the greatest engineers that India had produced Sir M. Vishweshwaraiah. Often referred as the ‘architect of modern Mysore’ or ‘father of planning in India’, Sir Vishweshwaraiah did created something ahead of his time with such precision and excellence, that it is popular sightseeing place of Mysore even today. In order to honour his vast contribution in the development of India and to acknowledge the greatness of his work, entire India celebrates 15 September as Engineer's Day. However, the name of the dam has been kept on the then king of Mysore Sri Krishnaraja Wodeyar IV, who has financed the entire project. One of the interesting features of KRS Dam is that Sir M. Vishweshwaraiah used a mixture of limestone and brick powder, called as ‘surkhi’, instead of cement as usually used in construction of other dams. The dam has walls with a length of 2621 meters and height of 39 meters. Its reservoir is about 130 Sq. Kms, which was the largest in Asia at the period when it was built. This dam is also called with the name of ‘Kannambadi Katte’ by the locals owing to the location of the dam. The Village name Kannambadi was derived from the Kanveshvara temple which was located in there. A small village named Kannambadi was chosen for KRS Dam location, which consequently got submerged in the waters as the dam was completed. The Prior to this, this place also called Kanvapuri, deriving its name from the great saint Kanva who is said to be have worshipped lord Shiva here. Although KRS Dam presents enchanting beauty throughout the year, the best time to visit Krishna Raja Sagara Dam (KRS Dam) is during and after the monsoon season. During the months of June to August, the water increases in the dam due to rainfall, creating a majestic view. Sometimes water flows through the gates that automatically open once the maximum limit of 124 Feet is reached. It is a site worth watching when the water gushes out the gate in full force, creating massive white streams of water. However, sometimes when the water level increases beyond a certain point, the dam is closed for visitors. Reaching KRS Dam is a hassle free task as it is connected by road and railways to Mysore and Bangalore. The town Srirangapatna where the dam is located is well connected to other prominent cities. Tourists can travel via train or buses and then take auto rickshaws from bus station or railway station to the dam. The trip can be completed within a few hours of time. Once you are at KRS Dam, do visit Brindavan Gardens and enjoy the startling beauty of illuminated terrace gardens and the enthralling musical fountains.